Walking requires a symphony of various nerve and muscle functions to develop the normal gait that we all take for granted. Normal gait requires an intact and functioning peripheral nervous system to send messages from the muscles and joints to the brain and receive messages back. Good balance (which is generally a central nervous system function) and normal muscle function are required. A functioning bone and joint support system (no arthritis, pain or deformities of the joints) is also required. A problem in any of these systems can cause ambulation difficulties. This section deals with the malfunction of gait from muscle weakness secondary to nerve injury. Walking is generally made efficient by the function of each joint and muscle working together to contribute to this efficiency. If a muscle is weak or a joint is painful, the gait slows down and the costs of energy expenditure to walk increases substantially. Running is a very different mechanism than walking in that there is a phase where both legs are not in contact with the ground and the body is suspended in mid-air without support. When the foot initially contacts the ground, it does so heel first (called heel strike). The quadriceps muscle group (L3-4 nerve in the front of the thigh) contracts immediately before the heel hits the ground to keep the knee bent and prevent the knee from buckling when the foot hits the ground. The knee never fully extends unless problems exist. The muscle that brings the foot up to allow the heel to hit the ground first is the tibialis anterior (L4 or L5 nerve). The foot will “slap” on the ground without contraction of this muscle (or won’t clear the ground in swing phase which will be discussed later). As a side note, when we tiptoe, we contract the calf muscles before heel strike (gastrocnemius/soleus muscles-S1 nerve) to force the toes down and have the ball of the foot meet the ground first. This reduces our stride distance as we lose the toe off phase of gait and our efficiency of walking is diminished accordingly. It is easier however to sneak up on someone. Upon heel strike, the foot “wants to turn in” or invert, especially when we are imbalanced or walk on uneven ground. The set of muscles that prevent the ankle from turning in at heel strike are the peroneals on the outside of the leg (L5 nerve). Once the heel hits the ground, the leg on the ground needs to pull the body forward. This propulsion is performed by the gluteus maximus muscle group (L5-S1 nerve) and the hamstring muscle group (S1 nerve). Contraction of these muscles propels the body forward by pulling the hip joint backwards (extending the hip) when the foot contacts the ground. As the body is pulled past the center of gravity at the hip joint (the balance point where the body is perfectly in the center of the ground) the body comes to the end of the hip range of motion. This is when the calf muscles come into play (S1 nerve-Gastrocnemius and Soleus). This muscle group pushes the foot down to plantar-flex (push off) and further propel the weight of the body forward. This is the heel rise portion of the stance phase of gait. The body is already forward of the foot in contact with the ground due to the contracture of the gluteal muscles. The heel rise then propels the body further forward through the contraction of the gastrocnemius and soleus muscles (S1 nerve). Both legs right at this point are in contact with the ground (stance phase). After the foot leaves the ground, this leg obviously becomes the swing phase leg. The swing phase starts when the foot leaves the ground. What is necessary for a proper swing phase is for the foot to clear the ground while the leg swings forward to prepare the heel to strike the ground once again. There is very little energy used in this phase as the swing leg acts like a pendulum from the hip joint that advances the leg for the next heel strike. The swing leg does need some muscular contraction to propel forward (through the psoas muscle) to get ready to again become the stance leg. However, due to the forward momentum, muscular strength in this phase is not greatly needed. Therefore, these muscles are generally weaker than the big propulsion muscles like the gluteus maximus. The trick with this swing phase is that the leg needs to become “shorter”. Shortening the leg prevents the foot from catching on the ground, which would cause a disruption in the gait and possibly a fall. There are three mechanisms that allow the swing leg to “become shorter”. The knee bends to help clear the leg from the ground. This occurs naturally without muscle contraction. Simply relaxing the quadriceps femorus muscle will cause this joint to bend as the leg swings forward. This “shortens the leg”. When the leg is suspended in midair, the foot could drag on the ground if it was plantar flexed (the toes pointed down-like tip toeing). The tibialis anterior muscle (L4 or L5) pulls the foot up to clear the toes from the ground. Finally, the gluteus medius muscle (L5-S1nerve) needs to contract on the opposite side to pull the pelvis up on the swing phase leg. The pelvis acts like a teeter-totter and will droop down on the side opposite the support leg (stance phase leg). A drooping pelvis on the swing leg will make this leg “longer”. The gluteus medius contraction on the opposite side prevents the pelvis from dropping down, which would shorten the leg and prevents the foot from dragging on the ground. There are basically two types of muscle contractions, eccentric and concentric contractions. There is no better situation to understand these types of muscular contractions than with ascending and descending stairs. Not only does ascending stairs use different muscle groups but also the types of muscle contractions necessary to perform this task are very different. Concentric contractions allow the muscle to shorten as it contracts. The classic example is found in weight lifting. Holding a barbell while contracting the biceps muscle flexes the elbow and lifts the barbell in a “biceps curl”. The muscle contracts and the joint flexes in response to lift the barbell. Ascending stairs starts with the action of lifting the leg up to the next stair. This is performed with a hip flexor muscle concentric contraction (psoas muscle-L1-2 nerve). Once the foot is in contact with the upper stair, the muscles that concentrically contract to lift the body up to this stair are the gluteus maximus and hamstring muscles at the hip (L5-S1 to straighten the hip) and the quadriceps group in the front of the thigh (L3-4 to straighten the knee). Finally, push-off by the lower foot assists in the final lifting of the body up the step. This action is performed through concentric contraction of the calf muscles (Gastrocnemius/Soleus muscle group-S1 motor nerve). Once the body is hauled up to this step, the opposite side takes over in reciprocal motion. In eccentric contraction, the muscle contracts while it elongates. This sounds unusual but is very common in day-to-day practice. When you descend a flight of stairs, your intent is to place the lower leg on the step below while the upper leg lowers your body to this step. The quadriceps muscle in the front of the leg has to contract to control the descent and prevent your body from falling. While contracting to support body weight, this muscle also has to elongate to allow the knee to bend and the opposite leg to descend to the next step. The lower leg then meets the next step. This contraction of the quadriceps while elongating is called an eccentric contraction. The gluteus maximus muscle also eccentrically contracts to descend the stair. The eccentric contraction requires much more force generation by the muscle than a concentric contraction. Due to this increased force, an eccentric contraction is where any neurological weakness will be initially uncovered with a nerve injury causing muscle weakness. You can see that there is a concert of muscular contractions that occur to allow the negotiation of stairs. Nerve injury will cause a hitch in this concert and cause the need to adapt to prevent falling. (Click to Enlarge Image) Fig. 4A – Trendelenberg gait. 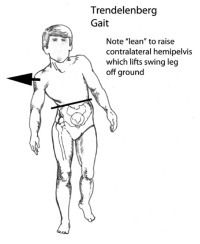 The patient leans to the side of weakness to use the torso to pull the opposite hip up while walking to prevent the foot from dragging on the gound copy. (Click to Enlarge Image) Fig. 4B – Trendelenberg test. The patient is asked to lift the foot up. The pelvis should pull the hip up on that side. A weakened gluteus medius muscle on the opposite side will let that hip droop copy. Femoral nerve stretch gait. The stride is reduced when the femoral nerve is under compression or inflammation as the further the hip is extended, the more the femoral nerve is stretched copy. Are you suffering from symptoms associated with a walking abnormality? Nerve compression can occur due to a disc herniation or bone spur formation in the lower back and can cause motor weakness. Weakness will first be noted as an abnormal gait. Pain inhibition can mimic nerve loss and muscle weakness. Pain can also be associated with nerve compression without weakness. The gait may still be altered by pain. The SI nerve supplies the calf muscles (gastrocnemius and soleus muscles), a portion of the gluteus maximus and most of the hamstring muscles. The calf muscles are required to push the toes down (push-off) at the end of the stance phase of gait. Without this push-off, the gait (stride distance) becomes shorter on this side. The walk will appear as a limp as there will be asymmetry of the stride between the good leg and affected leg. Running will be adversely affected. This effect is magnified with climbing stairs. The patient cannot lift their body higher using the push-off from the calf muscles. Ascending stairs, the patient will note they can lift their body higher on the non-affected side and will have to work harder to lift their body up on the weak side without push-off using the calf muscles. This weakness can also be noticed with descending stairs. The descending leg that contacts the lower stair normally will also have an extended (plantar-flexed) foot. The ball of the foot contacts the step first and the calf muscle eccentrically contracts to lower the heel to this step. This also reduces the force of impact on the knee and hip joint. On stairs, in the case of S1 weakness, the foot will land flat (heel first) and with more of a jolt to the spine. Both the L5 and S1 nerves supply the gluteus maximus muscle. If the gluteus maximus muscle is weak due to reduced supply from S1, there will be a weakness of propulsion forward on the stance leg. This will appear as a limp as the stride length will be limited. Ascending stairs will be significantly affected with gluteus maximus weakness. The action of stair step-up starts with lifting the leg up to the next stair. This is performed with contraction of the hip flexor (psoas muscle-L1-2). Once the foot is in contact with the upper stair, the muscles required to lift the body up to this stair are the gluteus maximus at the hip (L5-S1 to straighten the hip) and the quadriceps group in the front of the thigh (L3-4 to straighten the knee). The L5 nerve is involved with many muscles associated with gait. Most of these muscles are associated with the swing phase of gait. What is interesting is that this nerve innervates (supplies) many different muscles but generally, not all muscles that are connected to this nerve are weakened by an L5 nerve injury. The most common muscle weaknesses associated with the L5 nerve are tibialis anterior, extensor hallicus longus, gluteus medius and peroneal muscle weakness. Each has an effect on gait. Tibialis anterior weakness leads to foot drop. As noted previously, the swing leg needs to shorten while propelling through to the next heel strike. Functional shortening of this leg occurs by the actions of bringing the hip up, bending the knee and bringing the toes up. The foot lift is performed by the tibialis anterior and the upward hip is brought about by the gluteus medius contraction on the opposite side. A mildly weak tibialis anterior may cause no real problem. If the muscle is slightly weak, it will fatigue only after a prolonged walk. The patient might notice a “foot slap” at the end of a long walk. This is caused when the muscle fatigues and upon heel strike, the foot flops or uncontrollably “slaps” down on the ground. If the patient hikes any distance, the weakness would become more notable. 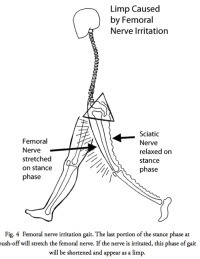 The steppage gait appears as an exaggerated step up while walking on flat ground. The individual raises the thigh up as if climbing stairs to clear the foot from dragging on the ground. 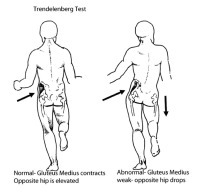 The Trendelenberg gait shifts the torso over to the side of weakness as the hip wants to drop on the opposite side of the weak muscle. This is seen as a lateral lilt to the weak side when looking at the patient from the front or rear. The torso shift “pulls” the dropped hip up by using the opposite hip joint as the fulcrum of this teeter-totter. The circumduction gait allows the patient to swing the leg out in a hemi-circular pattern to clear the foot. The foot will proscribe an arc with the center of the pendulum at the hip while walking. This EHL muscle is the “canary in the coal mine” for the L5 nerve. It starts life as a relatively weak muscle and in daily life has minimal purpose. If there is any type of significant L5 radiculopathy, this muscle will be almost always test weak. EHL weakness for most individuals causes no symptoms or deficits unless the patient is a rock-climber, a place-kicker for a football team or a martial artist. The benefit from this relatively weak muscle is really in diagnosis. If the tibialis anterior muscle is weak along with the EHL, you know this is an L5 nerve problem. If the EHL is strong in the face of a weak tibialis anterior muscle, this tibialis anterior muscle weakness is an L4 root problem. The peroneal muscles are the muscles that evert the foot (rotate the foot out) and prevent the foot from “turning in” with heel strike. Weakness in this muscle introduces the potential for spraining of the ankle. Walking on uneven ground will make this weakness very apparent with a feeling of instability. What is interesting is that even though the L5 nerve root dominates the peroneal muscles, weakness of this group is unusual even though there might be severe weakness present of the tibialis anterior and extensor hallicus longus. The L4 nerve can also supply the tibialis anterior muscle with resultant foot drop as noted with the L5 nerve weakness. The differential here from the L5 nerve is that there will be no EHL weakness noted if the L4 nerve governs the tibialis anterior. The L4 nerve can also occasionally contribute to the quadriceps femorus muscle but more likely, the L3 nerve will the major contributor. See quadriceps femorus muscle weakness in the L3 nerve injury section. The L3 nerve is the major contributor to the quadriceps femorus muscle. The main role of the quadriceps muscle is to support the bent knee during the stance phase. With a weak quadriceps muscle, knee collapse and a fall will occur if the knee is not fully extended. This is due to the locking mechanism of the knee. With full extension, the knee will lock and not bend. Patients with a weak quadriceps muscle will avoid standing on a bent knee by locking the joint in extension. In patients with a permanent weakness, the knee will hyperextend (genu recurvatum). With quadriceps weakness, the biggest fear these individuals have is with sudden knee buckling causing a fall. At full knee extension, the action of the quad is not necessary for stability of the knee joint. If the patient can keep their center of gravity in front of this locked joint, the knee will remain locked and the patient can vault over this leg in a characteristic pathological gait. This patient will not be able to run and will be incapable of walking on uneven ground. When this individual walks, they might externally rotate the weak leg to prevent buckling when loading this weakened knee. The rotation of the leg out (externally) occurs so that the knee joint will not be in line with the direction of travel. With the center of gravity force now medial to the joint line (which is what external rotation creates), the knee will have less of a tendency to buckle. This gait is also characteristic, as the patient will have a stiff legged gait with the foot pointed outward away from the direction of travel and look like they are vaulting over this leg. In severe cases, these patients will throw the weak leg forward-literally flinging the leg forward. They do this by using the pendulum motion at the hip and quick psoas contraction to hyperextend the knee and lock it before the leg touches the ground. On uneven ground, if the weakness is severe, some individuals might push their hand on the bottom of the femur right above the knee to force the knee into extension and prevent buckling. The most noticeable action to uncover weakness of the quadriceps muscle is with descending stairs. This eccentric contraction taxes this muscle like no other. Most individuals will hold onto the handrail and many will descend with only the weakened straight leg first as they can lock this knee joint before placing weight on it. They then descend using the strong leg on the upper stair to lower themselves down and only descend stairs, one step at a time with the good leg on the top step. The job of thrusting the leg forward during the swing phase of gait is the responsibility of the Iliopsoas muscle. Contraction of this muscle flexes the leg at the hip. Without the use of this muscle, the leg cannot be brought forward. The pathological gait is characteristic. The leg is flung forward by exaggerating torso rotation and using this pendulum force to advance the leg. Climbing stairs can be performed by manually lifting the leg to the next step with the hands as an assist. Once the leg is on the next upper step, the intact muscles can do their job of lifting the torso up. Arthritis of the hip joint which is much more common than psoas weakness can mimic weakness of the psoas muscle due to pain inhibition. This presentation is far more prevalent than psoas weakness due the L1 or L2 nerve loss. Any arthritic joint can be painful with loading and many arthritic joints will ache even when not loaded. Compression or loading of an arthritic joint will generally increase pain. One maneuver patients will use for reduction of joint pain is to limit the muscle forces at the painful joint. This will cause a pain inhibition response and a limp. Patients will adopt a pathological gait to minimize the compression (loading) of this joint. The gait evaluation can look like neurological weakness if care is not used to understand painful joint findings. Commonly, patients will use a cane or walker to assist with ambulation if the pain is too severe. Muscle contraction can increase the pressure on the hip joint to over 400 PSI, which will cause significant pain in an arthritic joint. This pain can be reduced with a simple torso lean, which will prevent the gluteus medius from contracting and increasing pressure in the joint. Look carefully at the gait. A Trendelenberg type of lurch (leaning over the opposite side of the body) can occur in hip disease due to painful loading. As noted before, the gluteus medius on the opposite side contracts to prevent the pelvis from dipping. Preventative contraction to reduce pressure will tilt the torso to the opposite side. Ask the patient if the gait is painful. Obviously in the case of radiculopathy, there will also be pain present but generally nerve pain will be spread out over a long path due to the nerve distribution. Pain directly in the joint without regional pain is not commonly due to radiculopathy. Check for joint pain. Compress the joints and range them under compression. Look at the hip, knee and ankles. Look for painful motion. If any lower extremity joint has no pain but limited range of motion, note this deficit. A contacted joint will alter gait causing a limp but generally this alteration due to joint contracture will not be painful. For the hip, have the patient lie down. Both legs should lie flat on the exam table. If there is a hip flexion contracture, one hip will still be flexed while the patient is lying on the table. Knee ROM is easy to assess and contractions can be diagnosed simply by comparing both legs together. Ankle range of motion is also easy to discern. This type of gait disorder does not involve problems with the central nervous system (CNS) but can look somewhat like a CNS imbalance type gait disorder. The brain requires significant amount of information to allow the smooth coordination of gait. Impaired knowledge of position of the legs in space makes walking difficult because the brain does not get the needed information regarding the alignment and position of the lower limbs. In a sensory neuropathy, the brain will be missing the feeling of pressure on the skin, the position of the legs, the tension of muscle contraction and the stress occurring in the joints.. In more complex neuropathies, this missing information might also involve motor deficits. With a sensory neuropathy, the patient literally cannot feel the foot on the ground. These patients might emphasize the initial foot contact with the ground (a stomp on the ground to make sure the foot is in contact with the ground). If there also is motor loss due to a motor neuropathy, this reduces the patient’s ability to make rapid muscular correction, resulting in slowing down of the gait and careful balance issues. The patient might look like they are walking on spongy ground. Since the patient has to rely on visual input for balance, darkened rooms will create greater difficulty with walking and balance. The CNS not only has to deliver messages to and from the legs, but also has to process this information and respond. Without central nervous system guidance, muscles generally want to be hyperactive (spastic-with uncontrolled contraction). It is the lower brain and spinal cord that slows these muscles down. If the brain or spinal cord is damaged, this tendency for strong contraction is not muted and a spastic uncoordinated gait can develop. If the injury is not too severe as in the case of mild myelopathy or central cord syndrome, there will be imbalance and incoordination without spasticity. Since the patient has to rely on visual input for balance, darkened rooms will create greater difficulty with walking and balance. Quick change in direction can magnify this disorder and place the patient in a potential to fall. If the condition worsens, the patient may develop a staggering wide-based gait. Some patients might develop a slow, small step gait like they are “walking on ice”. Chronic spinal cord compression causes myelopathy. The classical presentation of myelopathy is loss of balance with poor coordination, decreased dexterity of the hands, diffuse weakness and numbness in a non-dermatomal (nerve root) pattern. Patients will note they are clumsy and will often drop things. Questions asked like how their handwriting has changed, how they button buttons, zip zippers and place keys in a lock will reveal declining function. Pain can be a symptom in some patients but myelopathy generally is non-painful, as the spinal cord has no pain receptors. Neck pain can be present as a result of the degenerative changes that cause spinal cord compression. In older patients myelopathy often presents with a rapid deterioration of walking ability and hand function. They will be unable to walk at a fast pace. And quick changes of direction can cause falls. Electrical shocks radiating down the arms legs or spine are common, especially with head extension (bending the head backwards- L’hermitte’s sign). This disorder is somewhat similar to the peripheral neuropathy gait in that the brain does not get messages from the lower extremities. The difference is that there is incoordination of muscle movement and spasticity from the cord injury. The vestibular mechanism is the balance mechanism for the brain and body. This organelle in the inner ear tells the brain up from down and right from left. Vertigo is associated with dysfunction of the vestibular mechanism. Vertigo is the sensation of the room spinning. Nausea and vomiting can accompany this sensation. If dysfunction of this vestibular mechanism is very slow to progress, there might not be the tail tale signs of nausea and vomiting present. For additional resources on walking abnormalities, please contact the Vail, Aspen, Denver and Grand Junction, Colorado area office of Dr. Donald Corenman, spine specialist and back doctor.